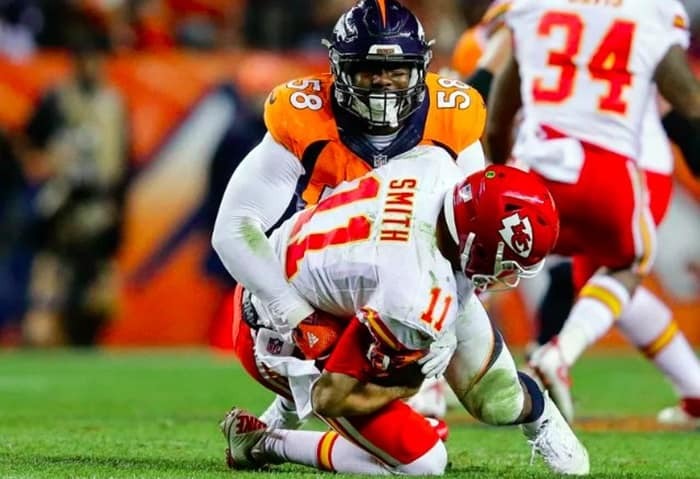 Whenever rivals like the Kansas City Chiefs and Denver Broncos play, the game is bound to be a hard-fought, down to the wire slugfest. Somehow these two always manage to bring out the best in each other. But with the Oakland Raiders improving to 9-2 after holding on to beat the Carolina Panthers earlier in the day, Sunday night’s game took on a whole new level of importance. The winner would improve to 8-3 and remain within striking distance of the AFC West title should the Raiders falter. The loser wouldn’t be out of the playoff hunt but would have a much tougher road ahead. Both teams are known for their tough defenses. With Justin Houston playing in just his second game of the season, the Chiefs pass rush was bound to be better than it has been all season. Sure enough—both defenses dominated the first half forcing three and outs on seven of the 13 first half drives (not counting the end of half kneel-down). It was actually the Chiefs defense that put the first points on the board with a sack in the end zone for a safety and a two-point lead. On the ensuing free kick, rookie wide receiver/kick returner Tyreek Hill returned it 86-yards for the first touchdown of the game and a 9-0 lead. Hill would go on to accomplish something that was last done by Gale Sayers in 1965—he scored a touchdown on a return, rushing (on his only carry that went for three yards), and receiving (he finished the night with nine catches for 52 yards) in the same game. Trevor Siemian finally got the Broncos offense moving on the drive following Hill’s kick-return, but the drive stalled at the Kansas City 15-yard line forcing the Broncos to settle for a field goal. Both offenses woke up in the second half. Denver scored a touchdown on its opening drive to take a 10-9 lead. But the lead was short-lived. Alex Smith engineered a 12 play, 75-yard drive in response to Denver’s score that ended with Tyreek Hill’s rushing touchdown. Defense took over the game again for a few drives, but then Siemian hit Emmanuel Sanders with a 35-yard touchdown pass midway through the fourth quarter to put the Broncos back on top, 17-16. Siemian appeared to ice the game on their next drive when Siemian hit Bennie Fowler with a 76-yard touchdown pass. With three minutes on the clock and up by eight, the game appeared to be in hand for the Broncos. All they needed was for their defense to do what it does and shut Kansas City down one more time—but it couldn’t and with 12 seconds left Alex Smith hit Tyreek Hill with a three-yard touchdown pass. They completed the two-point conversion, and the game went to overtime—where things got really interesting. Both teams scored field goals on their opening drive which meant the next score would win, but the offenses ate up too much time on the first two drives. There was just 4:19 on the clock when Denver got the ball back. 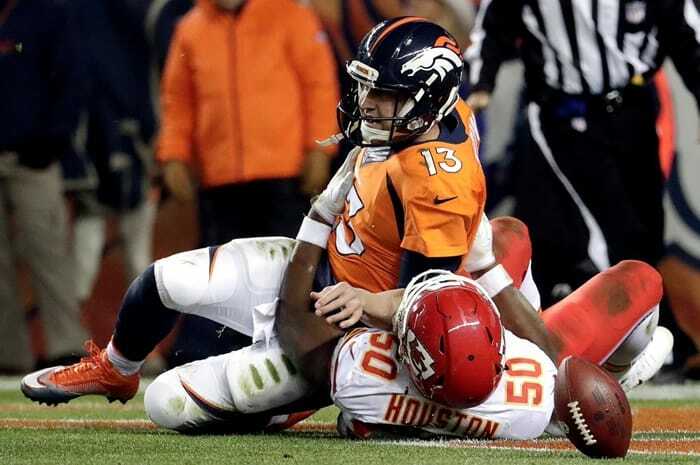 With two minutes to go, Denver had the ball on the Kansas City 44-yard line. It was plenty of time to get into position for a kick, but the offense failed to gain another yard leaving Gary Kubiak with a tough decision—play for the win and attempt a 62-yard field goal or play not to lose and punt the ball away. But this time his kick was short and to the left leaving Kansas City with great field position on the Denver 48-yard line and 1:03 on the clock. Five plays later Cairo Santos lined up for what should have been an easy 34-yard kick—but it doinked off the upright! 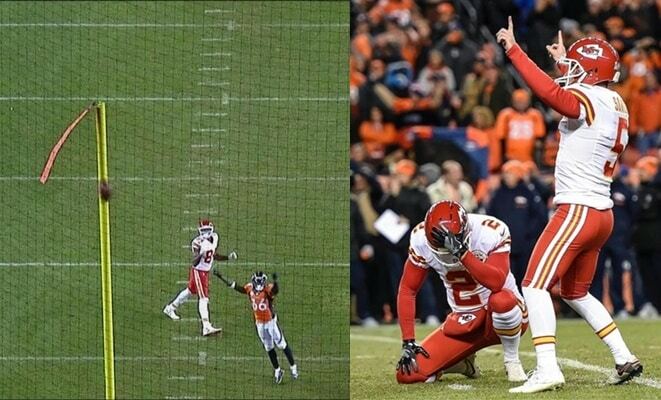 But then hit the other and ricocheted through the uprights to put the Chiefs up 30-27! With the win, the Chiefs improve to 8-3 and are in great position to take control of the division. Should they beat the Raiders in a couple of weeks, since the Chiefs will own the head-to-head tiebreaker, they will be in first place. But to keep it, they will have to beat the Broncos in Denver on Christmas Day.